Getting ready for the 2014 Season! Commission members, Sheila Sedlack and Noreen Marchand, were hard at work on May 22 planting the lovely SoMo garden with help from Noreen's daughter, Holly Cassaday. On May 22nd, cleanup day at the monument! 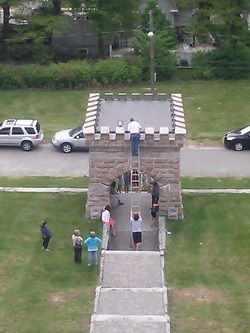 In addition to gardening, other chores included cleaning the inside of the monument, chores done by commission members, Tim Wheeler and Doug Werner. Meanwhile our "Jack" of-all-trades, and our "fix-it" guy is our treasurer, John Schweikart (up on the ladder). 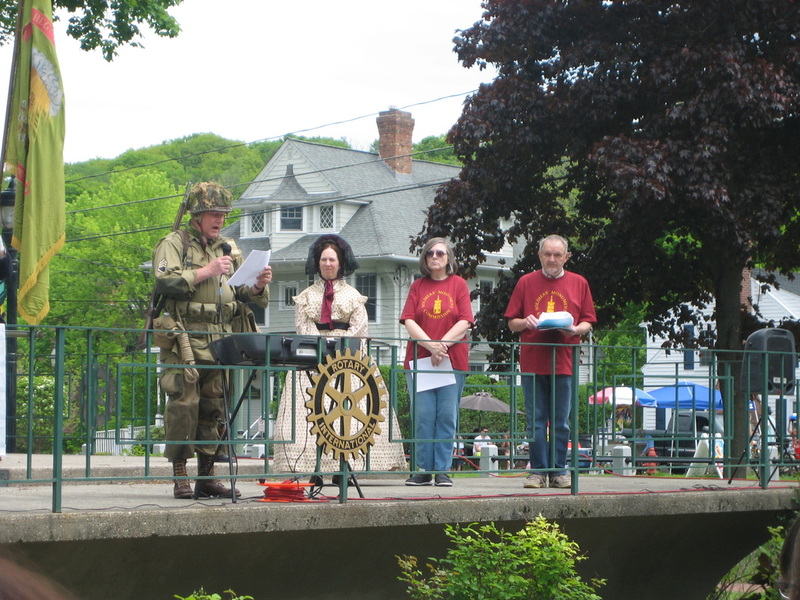 Virginia Shultz-Charette, our vice-chair, continued to work with numerous other historical societies, the Connecticut Civil War Round Table, the American Legion Post #27 and the National Park Service to present a day-long event in Litchfield on May 24th to commemorate the horrific battle of Cold Harbor that cost 3% of Litchfield County men their lives. She and Steve Dew of the Connecticut Civil War Round Table read the names of men from Company E (Winsted) of the Second Connecticut Heavy Artillery. 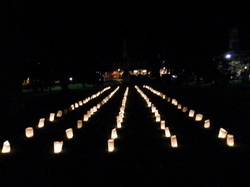 Luminaria on the Litchfield Green for the 141 who were killed in 15 minutes on June 1, 1864 at Cold Harbor. During the evening ceremony, all 141 names were read and soil from Cold Harbor was spread around the Litchfield Civil War monument, while soil from Litchfield was spread on the battlefield of Cold Harbor. 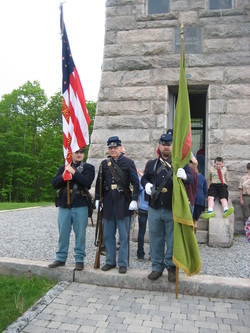 The Soldiers' Monument Commission was a participant and a sponsor of the event. member Deb Kessler standing next to him, then commission members, Virginia Shultz-Charette and Jack Bourque. Chair person, Steven Sylvester (not shown-he's shy...not) provided the sound system so that we could be heard! Prior to the parade in which we again marched, we held our solemn opening ceremony with prayer, the laying of the wreath, and the ceremonial salute. At 2 p.m. we were once again ready for visitors!